Since February 2016, PRO-LINK has been keeping a daily log of the delays and cancelations of Red Funnel, Wightlink and Hovertravel Solent crossings. It has become obvious that the websites of each company do not keep an accurate record of these delays and cancellations. 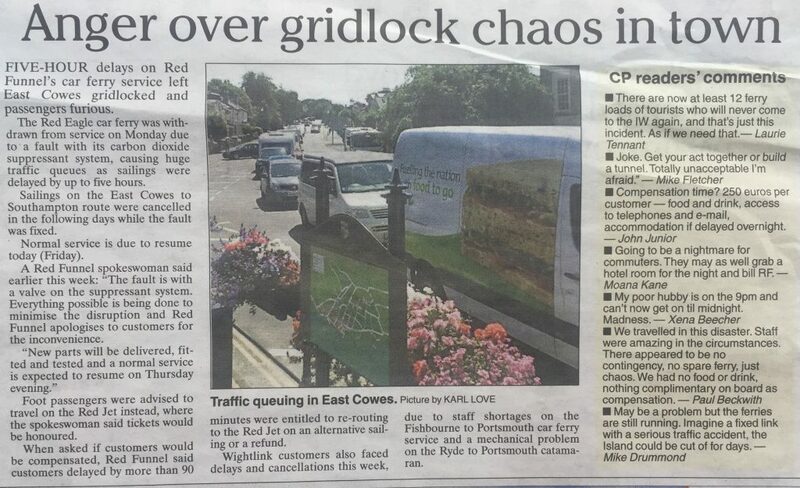 Whether travelling across the Solent to visit relatives or friends, catch a flight, connect with a train, go to school or college, a hospital appointment, a business meeting….. these delays and cancellations can cause havoc, frustration, lost education or income. Many people take the safer option if they have a necessity to be on the mainland in the morning, by travelling the night before and hiring a hotel room at extra expense. 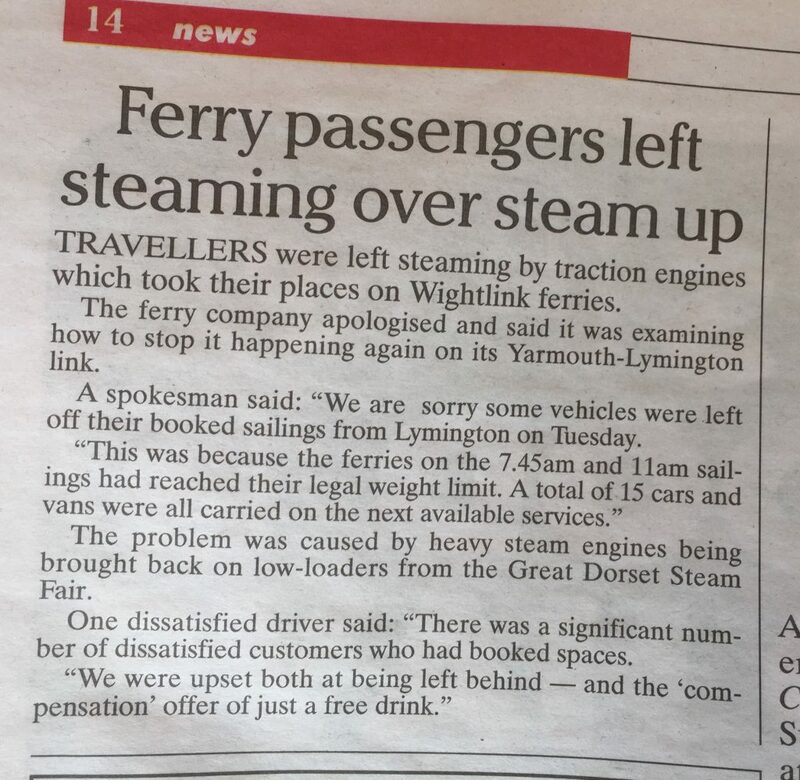 Some have even been fined for overstaying in the ferry company car parks due to the ferries being delayed. 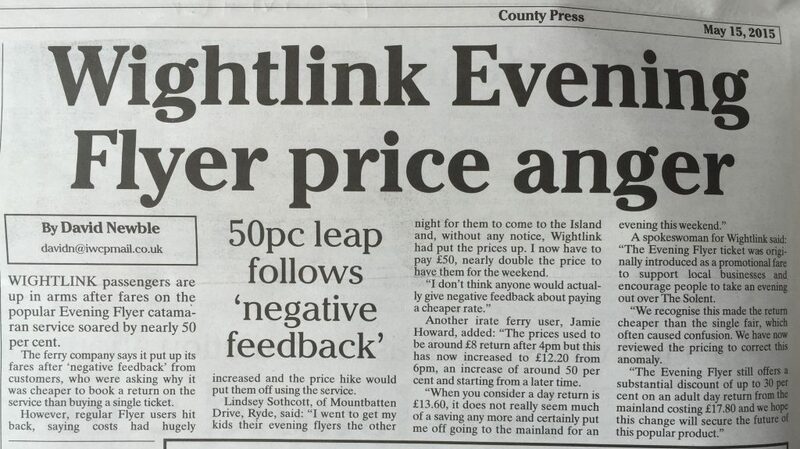 Should islanders have to put up with this? They wouldn’t with the Solent FREEDOM Tunnel. Our Portsmouth – Fishbourne (car ferry service) due to crew shortage the 1030 and 1230 sailing from Gunwharf and the 1130 and 1330 sailings from Fishbourne have been cancelled. Due to a technical issue, we are operating a shuttle service with arrivals & departures occuring as frequently as possible. A shuttle service is in operation. Arrivals and departures are occuring as frequently as possible but not to our standard timetable. Red Jet delayed by 40 mins due to reduced visibility. We apologise for the inconvenience to your journey. Due to technical reasons Hovertravel will be operating a one craft service with the following services cancelled tomorrow Monday 9th January. EX 07.30, EX 08.00, EX 08.30 from Ryde. EX 07.45, EX 08.15, EX 08.45 from Southsea. The technical failure has seen our engineers working tirelessly throughout today but sadly without success of a solution. The team will continue through the evening, but sadly further assistance is required and this is only available to us tomorrow. A shuttle service is in operation. Arrivals and departures are occurring as frequently as possible but not to our standard timetable. Wightlink’s P-F service is running at least 20 mins late due to operational difficulties. Service is currently suspended due to adverse weather conditions. Call 01983 717717 for immediate service updates. Red Jet XX45 from Southampton and XX15 from Cowes delayed by 10 mins due to adverse weather. West Cowes to Southampton Red Jet at 12:45 cancelled due to technical issue. We apologise for the inconvenience caused to your journey. Southampton to West Cowes Red Jet at 12:15 cancelled due to technical issue. We apologise for the inconvenience caused to your journey. Wheelchairs and mobility scooters: sorry, our catamaran sailings are currently not accessible for passengers with wheelchairs or mobility scooters. If you need any assistance, please call our free Reduced Mobility Helpline on 0800 0938 236, if possible at least 48 hours before travel. Cyclists and pushchair may have to carry this equipment on board when using the replacement gangway. This is because our manual walkway is being used. The 09:00 car ferry sailing from Portsmouth to Fishbourne, St Faith, has berthed at Fishbourne. On its journey a small fire broke out on the bridge and was extinguished by the crew within minutes, no one was injured. As a precaution emergency services met the ferry at Fishbourne. There were 52 passengers and 13 crew onboard the ferry. Investigations are underway into the incident. The Portsmouth-Fishbourne car ferry route will not be accepting any standby traffic without a booking on Friday, 20 Jan. The Portsmouth-Fishbourne car ferry will be running a revised timetable Friday, 20 Jan. Crossing times are extended this morning due to the heavy fog in the solent. Please allow extra time for your journey. The P-F (car ferry) are delayed by 90 minutes because of thick fog in Portsmouth Harbour. Wightlink The L-Y (car ferry) is suspended Because of thick fog. The P-F (car ferry) is delayed by 90 minutes Because of thick fog. The P-R (catamaran) The 1615 and 16:47 sailing are cancelled because of heavy fog. The L-Y (car ferry) is suspended until mid morning on Tuesday, 24 January 2017. Red Jet 4 is now in service and will be departing Southampton at 1745, our crossings are taking approx 40 minutes..
Red Jet is now operating a 2 boat shuttle service as there are extended crossing times due to reduced visibility. Hover – Due to dense fog our services are experiencing longer crossing times today, please allow additional time for your journey. Red Jet is now operating a shuttle service as there are extended crossing times due to reduced visibility. Our Lymington – Yarmouth (car ferry service) is suspended due to severe fog. Wheelchairs / mobility scooters: Sorry, our charter vessel sailings are currently not accessible for passengers with wheelchairs / mobility scooters. People with limited mobility may find it more difficult to board and leave the charter vessel. At certain tides, stairs may need to be used on board. Cyclists and pushchair users will have to carry this equipment on board when using the replacement gangway. Mind your Head: The clearance may be lower than usual when boarding the catamaran at low tides. Take care with your footing on the replacement gangway. East Cowes to Southampton Vehicle Ferry at 23:55 cancelled due to essential maintenance. Southampton to East Cowes Vehicle Ferry at 22:30 cancelled due to essential maintenance. East Cowes to Southampton Vehicle Ferry at 21:00 cancelled due to essential maintenance. Service is currently suspended due to adverse weather in the Solent. Red Jet suspended until further notice due to adverse weather. Our service is suspended due to technical reasons. There will be a further update at 1615 and we expect to resume operations shortly. Red Jet delayed by 10-15 mins due to adverse weather. East Cowes to Southampton Vehicle Ferry at 7:15 cancelled due to technical issue. East Cowes to Southampton Vehicle Ferry at 10:30 delayed by approx 30 mins due to an earlier technical issue. Southampton to East Cowes Vehicle Ferry at 12:00 delayed by approx 30 mins due to an earlier technical issue. East Cowes to Southampton Vehicle Ferry at 13:30 delayed by approx 30 mins due to an earlier technical issue. Southampton to East Cowes Vehicle Ferry at 15:00 delayed by approx 30 mins due to an earlier technical issue. Vehicle Ferry 21:00 from Southampton and 22:30 from East Cowes cancelled due to essential maintenance. West Cowes to Southampton Red Jet at 19:15 cancelled due to operational reasons. Southampton to West Cowes Red Jet at 18:45 cancelled due to operational reasons. The 18:15 foot passenger back to Ryde from Portsmouth, Is now delayed until further notice because of a “boarding ramp” issue. Our Lymington – Yarmouth (car ferry service) . The 14:05 sailing from Yarmouth is cancelled because of a mechanical problem and high winds. 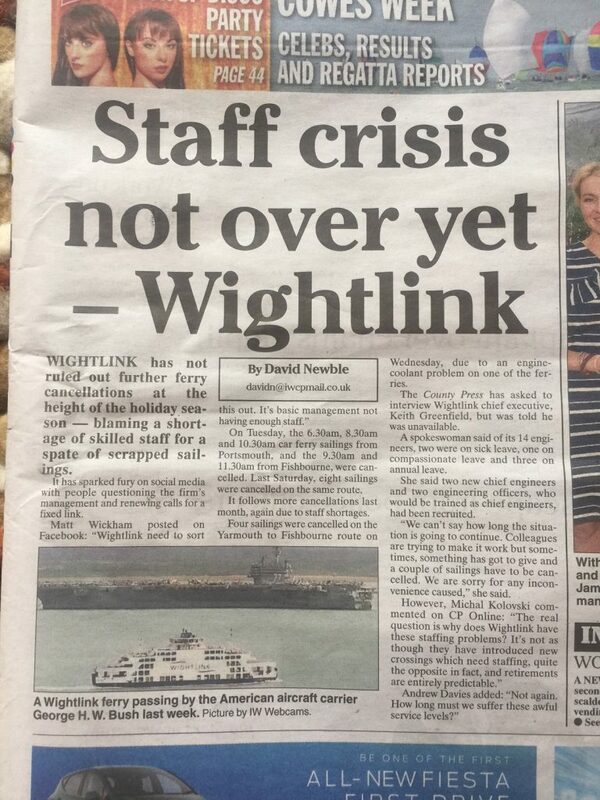 Sorry, all Wightlink Portsmouth ferry services are suspended due to the harbour being closed. Lymington services are operating normally. West Cowes to Southampton Red Jet at 17:15 cancelled due to waterjet obstruction. Southampton to East Cowes Vehicle Ferry at 5:45 cancelled due to technical issue. Apologies for any inconvenience. East Cowes to Southampton Vehicle Ferry at 7:15 cancelled due to technical issue. Apologies for any inconvenience. East Cowes to Southampton Vehicle Ferry at 4:15 cancelled due to technical issue. Apologies for any inconvenience. Southampton to East Cowes Vehicle Ferry at 2:45 cancelled due to technical issue. Apologies for any inconvenience. East Cowes to Southampton Vehicle Ferry at 10:30 cancelled due to technical issue. Apologies for any inconvenience. Southampton to East Cowes Vehicle Ferry at 9:00 cancelled due to technical issue. Apologies for any inconvenience. Our Vehicle Ferry is operating with delays of up to 2 hours due to earlier cancellations. Various delays/cancellations due to F-P ferry having to use the international port. Toilet facilities out of order on 1 ferry, only disabled toilet available! The P-R (catamaran) is delayed by 30 minutes because of fog. The L-Y (car ferry) is delayed by 20 minutes because of fog. The P-R (catamaran) is delayed by 45 minutes because of fog. Our Portsmouth – Fishbourne (car ferry service) are delayed by up to 50 minutes due to a mechanical issue. East Cowes to Southampton Vehicle Ferry at 21:00 cancelled due to technical issue. Apologies for any inconvenience. Southampton to East Cowes Vehicle Ferry at 19:30 cancelled due to technical issue. Apologies for any inconvenience. 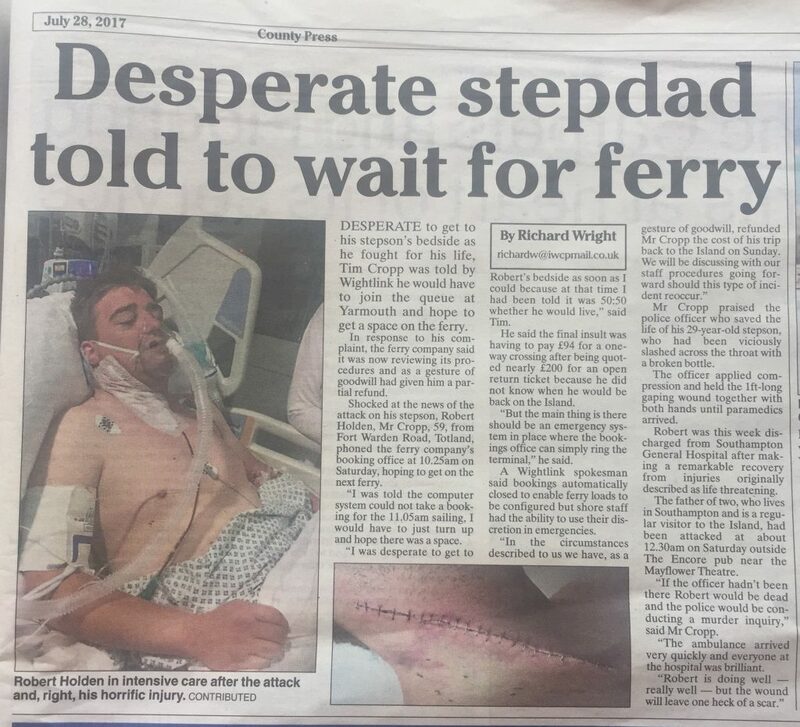 Our Portsmouth Harbour – Ryde (catamaran service) Wheelchairs and mobility scooters: sorry, our catamaran sailings are currently not accessible for passengers with wheelchairs or mobility scooters. If you need any assistance, please call our free Reduced Mobility Helpline on 0800 0938 236, if possible at least 48 hours before travel. Cyclists and pushchairs may have to carry this equipment on board when using the replacement gangway. This is because our manual walkway is being used at our Ryde Pier catamaran terminal. Ports – Ryde service is suspended until further notice. Southampton to East Cowes Vehicle Ferry at 19:30 delayed by approx 55 mins due to medical incident. East Cowes to Southampton Vehicle Ferry at 21:00 delayed by approx 45 mins due to medical incident. This is due to a technical issue with the loading ramp at our Portsmouth terminal. Our Lymington – Yarmouth (car ferry service) is delayed by 1hr because of thick fog. Wightlink’s Portsmouth to Fishbourne service anticipates delays today due to a mechanical problem with St Clare. Lymington to Yarmouth service is also delayed due to heavy fog. Hovertravel – Isle Of Wight Portsmouth Ferry LinkServices are running with a 10 minute delay. East Cowes to Southampton Vehicle Ferry at 14:30 delayed by 15-20 mins. West Cowes to Southampton Red Jet at 16:15 cancelled due to technical issue. West Cowes to Southampton Red Jet at 14:15 cancelled due to a technical issue. The P-F (car ferry) are delayed by up to 50 minutes because of traffic. Hovertravel – Isle Of Wight Portsmouth Ferry LinkA shuttle service is in operation. Arrivals and departures are occuring as frequently as possible but not to our standard timetable. Our Portsmouth – Fishbourne (car ferry service) is diverted to Portsmouth Internation Port (signposted cruise and cross channel services) until further notice today. We will be running on a trip by trip basis from this port. This is due to overrunning maintenance to our loading ramp. Our Portsmouth – Fishbourne (car ferry service) is delayed by up to 45 minutes. Please check-in as normal, 30 minutes before your scheduled departure time. Our service is currently suspended due to adverse weather conditions in the Solent. Southampton to West Cowes Red Jet at 12:15 cancelled due to technical issue. West Cowes to Southampton Red Jet at 13:45 cancelled due to technical issue. Southampton to West Cowes Red Jet at 13:15 cancelled due to technical issue. Our Portsmouth Harbour – Ryde (catamaran service) due to a mechanical issue with Wight Ryder 2, the 06:40 has been cancelled. The 07:10, 08:10 and 09:10 from Ryde, and the 07:40 and 08:40 from the Harbour will be provided by a charter vessel(approx 25 minutes crossing time). All other sailings as normal timetable. Red Jet delayed by 15-20 mins due to speed restrictions. We apologise for the inconvenience to your journey. West Cowes to Southampton Red Jet at 7:15 cancelled due to technical issue. 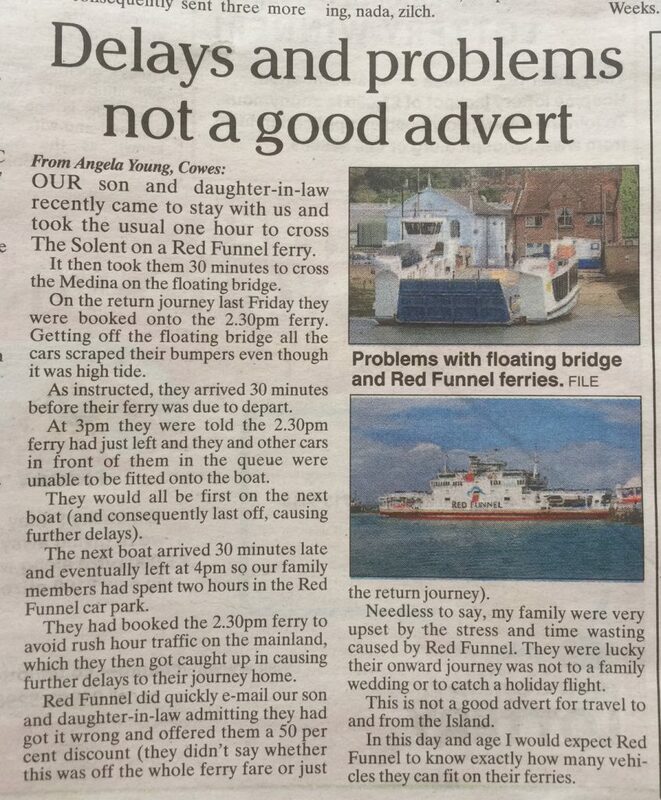 Southampton to West Cowes Red Jet at 6:45 cancelled due to technical issue. Red Jet delayed by 10-15 mins due to speed restrictions. We apologise for the inconvenience to your journey. Our Portsmouth – Fishbourne (car ferry service) is delayed. The electrical problem with one of our ships has now been resolved, and sailings are delayed by upto 60 mins. On Wednesday, 24 May 2017 our Portsmouth Car Ferry Terminal will be closed for most of the day and sailings will be operating to and from the Portsmouth International Port (Cruise and Cross Channel Ferry Terminal). We will only accept booked vehicles during this time and foot passengers can only travel on our Portsmouth Harbour to Ryde Pier Head passenger catamaran route. Hovertravel – Due to dense fog, a shuttle service is in operation with arrivals and departures occuring as frequently as possible but not to our standard timetable. We do apologise for any inconvenience. Our Portsmouth – Fishbourne (car ferry service) is delayed by 30 minutes because we need to take a longer route than usual due to lower than predicted tides. East Cowes to Southampton Vehicle Ferry at 17:30 delayed by 15-20 mins. We apologise for the inconvenience to your journey. Our Portsmouth – Fishbourne (car ferry service) Good news, our engineers have rectified our mechanical issue. The 08:30 ex Fishbourne will now run, albeit with a minor delay. Again, apologies for any inconvenience caused. The P-F (car ferry) 09.30 sailing has been cancelled due to staff absence. Southampton to East Cowes Vehicle Ferry at 14:00 delayed by 15 mins due to operational reasons. We currently are unable to make bookings or amendments over the phone due to a technical issue with our phone system. Bookings can still be made online. We will update you as soon as this issue has been resolved. The P-F (car ferry) Delayed by up to 35 minutes due to high volumes of traffic. Our Portsmouth – Fishbourne (car ferry service) is delayed by up to 80 minutes because we are changing how one of our vessels docks today due to a mechanical problem. Red Jet delayed by 20-25 mins due to waterjet obstruction. We apologise for the inconvenience to your journey. 0930 East Cowes to Southampton vehicle ferry delayed by 20 mins due to a medical emergency on the car deck. The patient was taken to A&E. Our Portsmouth – Fishbourne (car ferry service) Sorry we are delayed by 25 minutes due to a slower loading time on one of our earlier sailings. We are doing our best to catch up as quickly as possible. St. Faith – 7am crossing from F to P. Loading problems with the top car deck – up and down till it locks into position. Several cars had to come off – delays already! Not feeling safe parked under this deck. The P-F (car ferry) is delayed by up to 45 minutes because of a earlier mechanical problem. Our Portsmouth – Fishbourne (car ferry service) is delayed by 25 minutes as it took longer than expected for a large foot passenger group to board the ferry. Our Portsmouth – Fishbourne (car ferry service) is delayed by up to 40 minutes because of a high volume of traffic. Our Portsmouth – Fishbourne (car ferry service) is delayed by 30 minutes due to a broken down lorry on board, and harbour movements. Our Lymington – Yarmouth (car ferry service) is running a good service as we have managed to get cover for the sick crew member so, we are back to the normal timetable. The P-F (car ferry) is delayed by 30 minutes due to an electrical problem at Gunwharf. West Cowes to Southampton Red Jet at 9:45 cancelled due to technical issue. We apologise for the inconvenience caused to your journey. Our Portsmouth – Fishbourne (car ferry service) is suspended until further notice due to an ongoing incident with a passenger on board. The L-Y (car ferry) the 16.00 from Lymington is cancelled due to an earlier mechanical problem. Our Portsmouth – Fishbourne (car ferry service) is delayed by up to 40 minutes due to our vessel waiting for a small boat to be moved safely out of the way. We are very sorry but due to a crew shortage we have had to cancel sailings on our Portsmouth – Fishbourne car ferry service and are running a revised timetable on Saturday, Sunday and Monday. East Cowes to Southampton Vehicle Ferry at 18:30 delayed by 4 hours due to technical issue. If you are booked on this sailing please arrive no earlier than 21:30 for a new departure time of 22:30. East Cowes to Southampton Vehicle Ferry at 19:30 cancelled due to technical issue. If you are booked on this sailing please arrive no earlier than 22:00 for a new departure time of 23:55. All other sailing will be running as scheduled however delays are to be expected, we apologise for any inconvenience caused to your journey. Our Vehicle Ferry service is delayed by approx 15 mins. 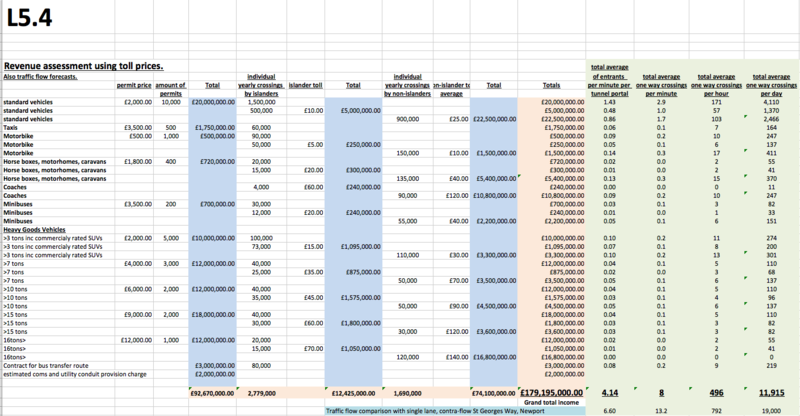 We are working to reduce delays and apologise for the delay to your onward journey. The P-F (car ferry) is delayed by up to 45 minutes because of an earlier mechanical problem. On the 7.15 ferry from East Cowes. Just got to Southampton and they can’t unload any cars or passengers as the link span is damaged so now returning us to east cowes. Vehicle Ferry delayed by up to 2 hours due to a technical issue with the Linkspan in Southampton. We apologise for the inconvenience. East Cowes to Southampton Vehicle Ferry delayed by 3-4 hours due to a technical issue with the Linkspan in Southampton. Vehicle Ferry leaving Southampton at 1700 and East Cowes at 1830 cancelled due to essential maintenance. We apologise for the inconvenience caused. We’re very sorry, we’ve had to cancel the following sailings on Saturday because of staffing issues. All affected customers have been moved to alternative sailings. Our Vehicle Ferry service is delayed by 15-20 mins. We are working to reduce delays and apologise for the delay to your onward journey. Hovertravel – Isle Of Wight Portsmouth Ferry LinkWe are running with up to 15 minutes delay due to high winds in the Solent. Due to road closures the Hoverbus will not be stopping at Portsmouth & Southsea. The bus will now take a longer and different route after Commercial road to rejoin Winston Churchill Avenue. Our Portsmouth – Fishbourne (car ferry service) due to staff shortage the 0630 sailing from Gunwharf and the 0730 sailing from Fishbourne have been cancelled. Red Jet departing Southampton at 19:15 and Cowes at 19:45 cancelled due to the harbour closure for Cowes Firework Night. Southampton to West Cowes Red Jet at 23:45 cancelled due to operational reasons. We apologise for the inconvenience caused to your journey. West Cowes to Southampton Red Jet at 00:15 cancelled due to operational reasons. We apologise for the inconvenience caused to your journey. 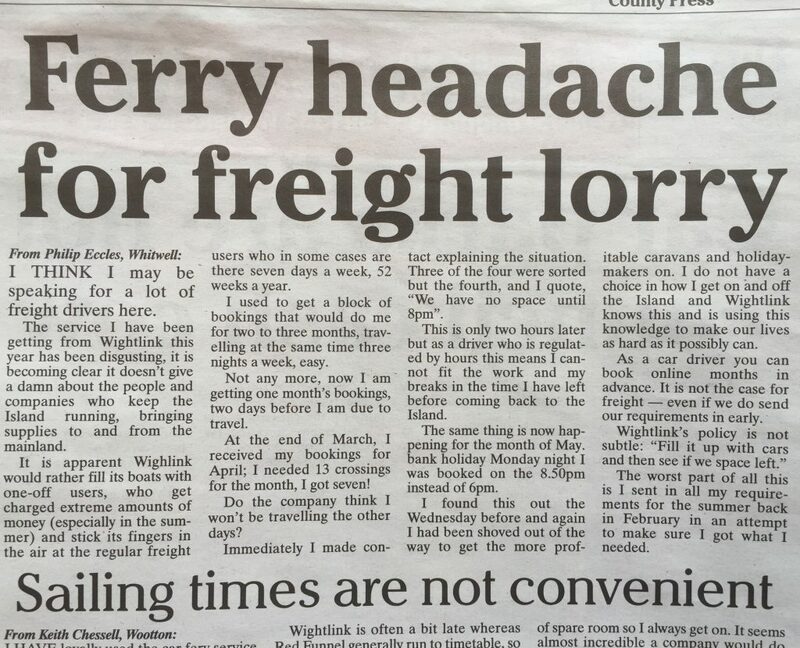 The P-F (car ferry) is delayed by up to 20 mins because of an earlier broken down vehicle on board. A two craft service is in operation, with arrivals and departures occurring as frequently as possible, but not to our standard timetable. We do apologise for any inconvenience caused. Our Portsmouth – Fishbourne (car ferry service) is delayed by up to 40 minutes because of earlier harbour movements though we’re working hard to make up time. Our Portsmouth Harbour – Ryde (catamaran service) due to a mechanical failure the 06:40 , 07:40 , 0840 sailings from Portsmouth Harbour and the 07:10 , 08:10 , 09:10 sailings from Ryde Pier have been cancelled. A shuttle service is in operation. Arrivals and departures are occurring as frequently as possible. Due to Technical reasons the 0730/0800/0830 from Ryde and 0745/0815/0845 from Southsea have been cancelled for Thursday morning. Our Portsmouth – Fishbourne (car ferry service) is delayed by 30 minutes due to a problem with the loading ramp, which has now been resolved. Our Vehicle Ferry service is delayed by 15-25 mins. We are working to reduce delays and apologise for the delay to your onward journey. Our Vehicle Ferry service is delayed by 20-25 mins. We are working to reduce delays and apologise for the delay to your onward journey. We would like to apologise for the delays today, we will keep you all updated as and when anything changes. Hi there, just a quick update, the 30 min delay P-F is due to damage caused to the propeller blade seal. red funnel-Vehicle Ferry Southampton to Cowes 17:00 and Cowes to Southampton at 18:30 on 05/09 cancelled due to essential maintenance. Apologies for any inconvenience. Our Portsmouth – Fishbourne (car ferry service) is delayed by up to 25 minutes because of an engine cooling system problem one of our vessels is sailing slower than usual today. West Cowes to Southampton Red Jet at 8:15 cancelled due to adverse weather. We apologise for the inconvenience caused to your journey. West Cowes to Southampton Red Jet at 7:45 cancelled due to adverse weather. We apologise for the inconvenience caused to your journey. 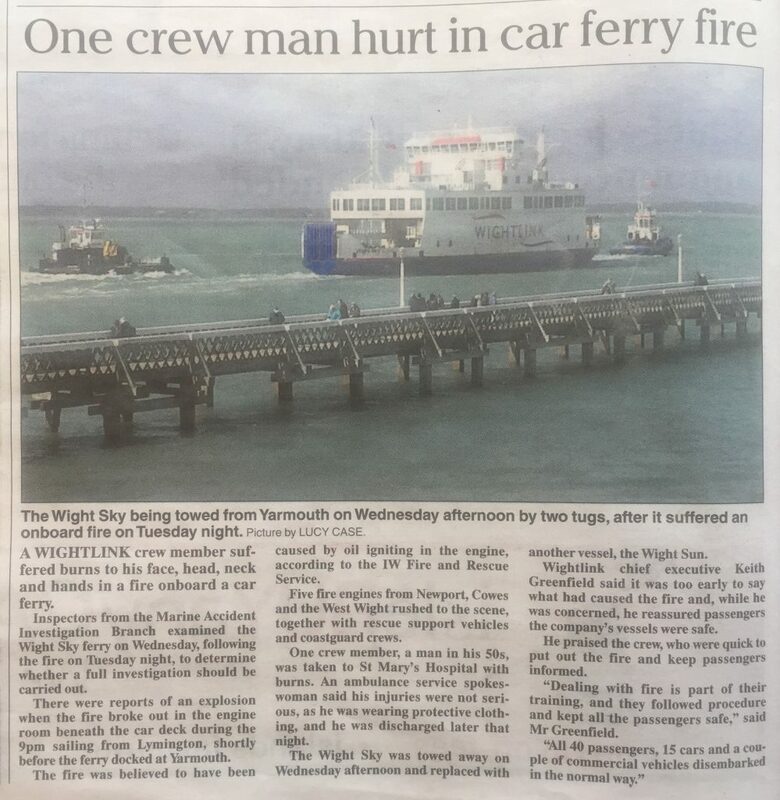 Our Lymington – Yarmouth (car ferry service) is suspended this morning due to an incident( Fire) on board the Wight Sky on arrival at Yarmouth. We’ll keep you updated as soon as we have more information. We are currently operating to timetable, however due to high winds on the Solent there may be some disruption to the service. Hovertravel – Isle Of Wight Portsmouth Ferry LinkServices are running with a 15 minute delay. Sorry, due to a mechanical issue on St Cecilia our bookings are temporarily closed until Monday morning. We will update you asap. We will be running a revised timetable between our Portsmouth and Fishbourne car ferry terminals this Friday, 22 September, and on Sunday, 24 September 2017. The 08:45am ferry on our Y-L route is cancelled due to an mechanical issue. Vehicles were removed and loaded on the 10:30am. Now running a 1 boat service with at least 2hr delays. We will update you as soon as possible. Our Portsmouth – Fishbourne (car ferry service) The 06:30 & 08:30 sailings from Portsmouth and the 07:30 & 09:30 sailings from Fishbourne are cancelled because of overunning maintenance. Red Jet running a one boat service departing Cowes at XX45 and Southampton at XX15 due to adverse weather. 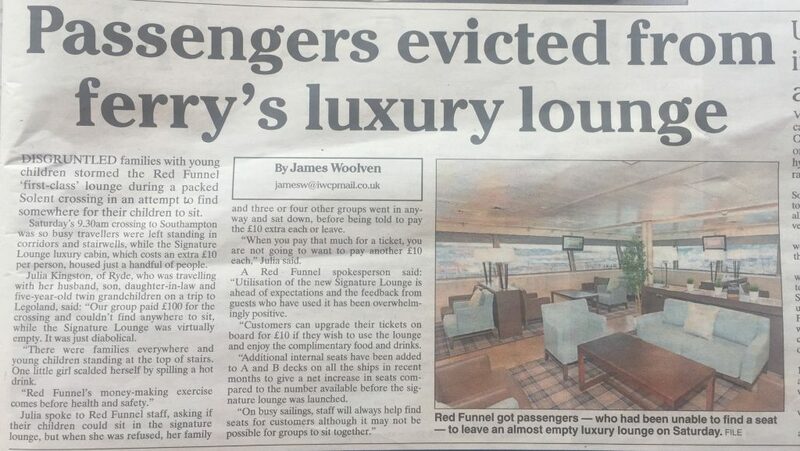 Our Red Jet service has now been cancelled till further notice due to adverse weather. We apologise for any inconvenience this may cause. Good afternoon, Lym – Yar is currently delayed by 30 minutes due to high winds. We are sorry if this affects your journey. Southampton to East Cowes Vehicle Ferry at 12:00 delayed by 15-20 mins due to earlier essential maintenance. Sorry, Our Lym – Yar route is delayed by 20 minutes due to a medical emergency. Please check in on time as we work to make this time back. East Cowes to Southampton Vehicle Ferry at 13:30 delayed by 1hr 30mins for all booked vehicle traffic due to earlier reduced visibility. Our Lymington – Yarmouth (car ferry service) have cancelled the 06.40, 08:45 & 11:00 sailings from Lymington and the 07:50, 10:05 & 12:05 from Yarmouth on Friday 3rd November. This is due to a plumbing issue on board one of our vessels. Red Jet delayed by 10 mins due to reduced visibility. We apologise for the inconvenience to your journey. Vehicle Ferry delayed by at least 60mins due to reduced visibility. We are working to reduce delays. Red Jet XX45 from Southampton and XX15 from Cowes delayed by 10-15 mins due to speed restrictions. East Cowes to Southampton Vehicle Ferry at 19:30 delayed by 30 mins due to medical incident. TRAVEL: Hovertravel services between Ryde & Southsea running normally again now. Technical probs have been resolved. Hovertravel – A shuttle service is in operation. Arrivals and departures are occuring as frequently as possible but not to our standard timetable. Portsmouth-Fishbourne (car ferry service) is delayed by up to 30 minutes due to a technical issue with the loading ramp on board. Please check in on time as we work to make this time back. We hope to make this back by the 2pm sailing from Portsmouth. Sorry, today we have restricted capacity on one of our vessels on the Por – Fis route, we will be putting on additional sailings to compensate. These will be 15:30 & 17:30 from Portsmouth & 16:30 & 18:30 from Fishbourne. Red Jet delayed by 15-20 mins due to adverse weather. We apologise for the inconvenience to your journey. Sorry, we are running an hourly service only on our Ports Harb to Ryde route due to a mechanical issue on our FastCat. Red Jet delayed by approx 15 mins due to technical issue. We apologise for the inconvenience to your journey. Wightlink – Apologies to our FastCat customers, the 06.40, 16.40, 17.40 and 18.45 from Ports Hbr and the 17.10, 18.10 and 19.15 from Ryde are cancelled Mon 27 Nov due to an ongoing mechanical issue with our Wight Ryder. We’re working hard to resume our timetable for Tuesday. Southampton to West Cowes Red Jet at 17:45 cancelled due to technical issue. West Cowes to Southampton Red Jet at 18:15 cancelled due to technical issue. Red Jet running a one boat service departing Southampton at XX45 and Cowes at XX15 due to adverse weather. Sorry our Ports – Fish route is delayed by 30 mins because of a broken down vehicle on board. 10am…We are working hard to remove the vehicle as quickly as possible. Southampton to East Cowes Vehicle Ferry at 5:45 cancelled due to technical issue. Southampton to West Cowes Red Jet at 9:45 cancelled due to adverse weather. West Cowes to Southampton Red Jet at 10:15 cancelled due to adverse weather. Dear customers, we are very sorry our 06:40 sailing from Yarmouth and the 07:50 sailing from Lymington has been cancelled due to essential crew shortage. Our apologies once again for any inconvenience this may cause you. A two craft shuttle service is in operation, with arrivals and departures occurring as frequently as possible, but not to our standard timetable. Red Jet delayed by 15-20 mins due to reduced visibility. We apologise for the inconvenience to your journey. We are now operating to timetable but our crossing times are extended due to the fog which remains in the Solent. Due to a technical issue a one craft shuttle service is in operation with arrivals and departures as frequent as possible but not to our standard timetable. Red Jet XX45 from Southampton and XX15 from Cowes delayed by 10 mins. We are working to reduce delays and apologise for the delay to your onward journey. West Cowes to Southampton Red Jet at 7:45 cancelled due to technical issue. Southampton to West Cowes Red Jet at 7:15 cancelled due to technical issue. Red Jet running a one boat service departing Southampton at XX45 and Cowes at XX15 due to technical issue. Sorry, due to the bad weather our FastCat service from Ryde Pier Head and Portsmouth Harbour is running with delays of up to 30 minutes this afternoon. East Cowes to Southampton Vehicle Ferry at 9:45 cancelled due to technical issue. East Cowes to Southampton Vehicle Ferry at 10:30 delayed by 90 mins due to technical issue. East Cowes to Southampton Vehicle Ferry at 18:45 cancelled due to technical issue. Southampton to East Cowes Vehicle Ferry at 17:15 cancelled due to technical issue. East Cowes to Southampton Vehicle Ferry at 15:45 cancelled due to technical issue. Southampton to East Cowes Vehicle Ferry at 14:15 cancelled due to technical issue. Unfortunately the weather has once again forced us to suspend our service. Sorry, we’ve had to cancel our 07.30 sailing from Fishbourne to Portsmouth this morning due to a technical issue with one of our ships. All other sailings are running as usual. Sorry, if you’re sailing with us today from Ports or Fish, please be aware the lift on St Faith is not available while our engineers make repairs. Sailings are half past the even hour from Ports until 18.30 and half past the odd hour from Fish until 19.30. Sorry, St Clare is running with delays of up to 30 mins due to an earlier technical issue with one of our other ships. The sailings are scheduled to leave Portsmouth on the odd hour and Fishbourne on the even hour. Sorry, the 14:15 from Portsmouth Harbour and the 14:47 from Ryde Pier Head are cancelled today, due to essential mechanical equipment maintenance on the loading ramp at Ryde Pier. We are sorry for the disruption to your travel plans today. The 15:30 from Por – Fish and 16:30 from Fish – Por are cancelled due to an issue with an essential piece of technical equipment. Booked customers will travel on the next available sailing.